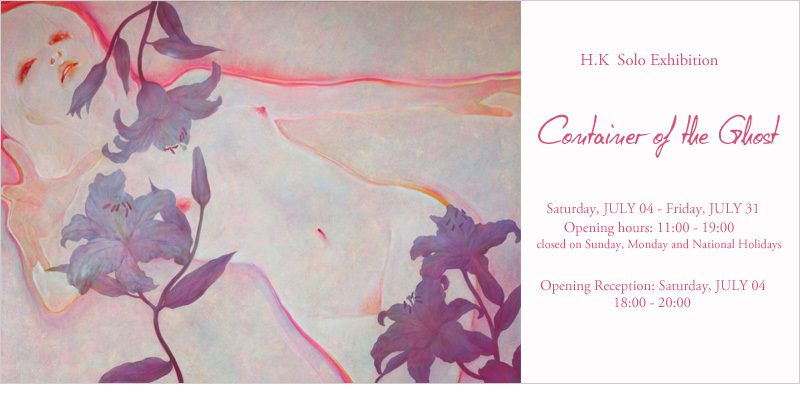 Kinosho Kikaku is pleased to present to you “Container of the Ghost―H.K solo exhibition”. For H.K, the soul is stuck on the body rather than existing within it. There are times when he feels as if his soul will be slipped off the body and nowhere to be found, as if the human body is a container, and the soul constantly disagrees to settle within it. The existence of the consciousness becomes chaotic and doubtful. Through the act of painting, he is able to grasp the solid feeling of being alive as a human being. In such sense, his works can be considered as the result of the struggling of preventing his chaotic self consciousness from fading away, a testimonial“lump”that might as well compensate the complicated feelings of doubtfulness of the existence of the soul. “I feel like I am able to feel truly alive as I try to portray the slipping away of the soul.” He commented. This exhibition shows works that depict “the soul’s attachment to the body”, and “the body as the container of the soul”, adding in flowers as significant symbolic elements to the theme. 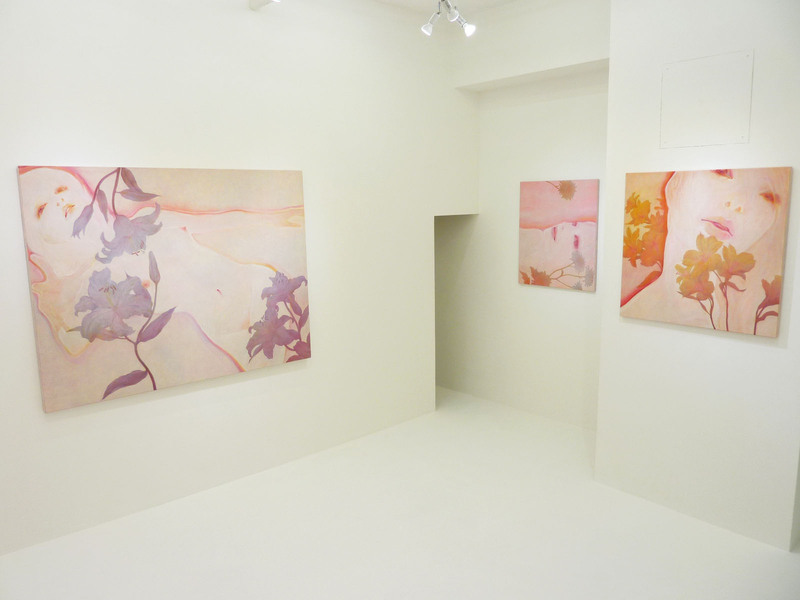 H.K considers his works more as landscape paintings than a composition of flowers and human figures . By transforming human figures into landscapes, the human characteristics decade thus make them become more of an obscure figure. The unique spacial composition of “Ma” in Japanese painting also elaborates the presentation of the soul trapped between life and death. The blossoming and decaying of flowers, on the other hand, symbolizes the passage of time. It is a celebration of birth and at the same time, a farewell tribute to death. Flowers serve as an amplification of the image of human. In his works, the two surpass the physical boundaries of flowers and human and purely exist as living creatures of equality. Both serve as the carriers that express the relationships between alive and death as well as body and soul. This very exhibition may be an inspiration for us to recognize the presence of our soul. We sincerely hope you can enjoy his unique view of the world. 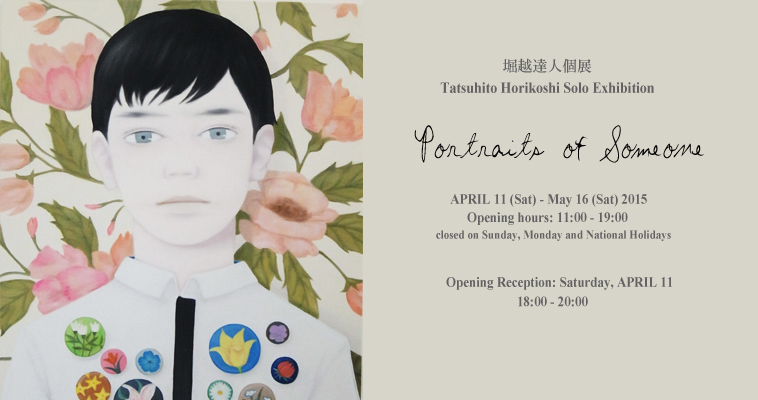 Kinosho Kikaku is honored to present to you “Portraits of Someone-Tatsuhito Horikoshi Solo Exhibition”. Born in 1985, Tatsuhito Horikoshi is an emerging artist who bases his creative activity in Tokyo. “I was impressed by Elizabeth Peyton’s portraits of rock singers and movie stars, thus began to draw paintings of whom I admire” said Horikoshi. However, he draws no reference from the reality, and creates all the characters based on his own imagination. The delicate use of light colors and deliberate attempt of bedimming the details grant a touch of abstractness to the work, endowing a sense of uncertain ubiquity that leaves us a blur imagination of an unknown stranger. 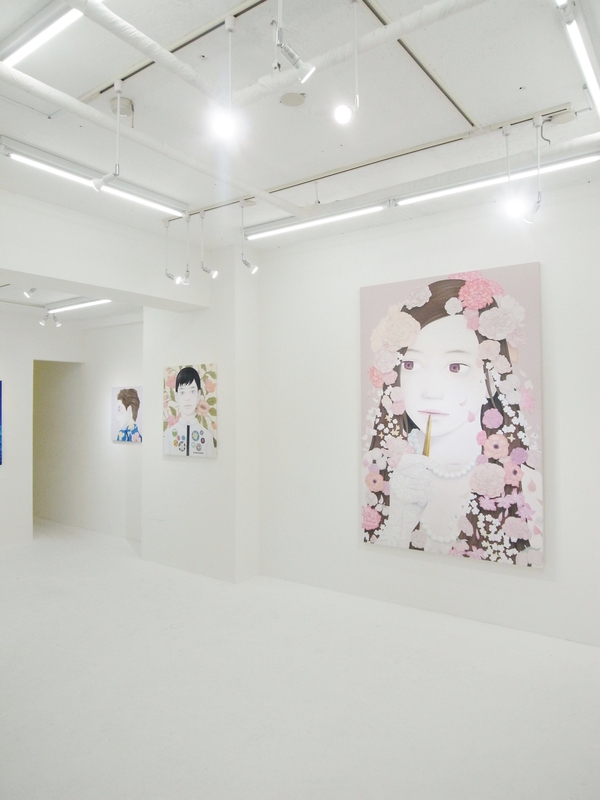 The cute and enduring characters portrayed in his works are two dimensional with obvious traces of Japanese subculture. Though he grew up greatly influenced by various kinds of animation and manga, he tries to distinguish himself from its ordinary representation. The carefully selected motif, abstractness indulged pictorial space and bittersweet longing of nostalgia share similarities with New Figurative artists such as Peter Doig and Elizabeth Peyton, and at the same time distinctive from the animeinspired works of Murakami Takashi and other similar artists. The immense expansion of the internet nowadays is constantly refreshing the definition of art and expanding its limitation. New art forms are created with the help of modern technology. In the midst of such ever-changing world of art, Horikoshi still dedicates himself to portrait painting. Through his works, we hope to reemphasize the universality and importance of portrait painting. In this very exhibition, we are featuring a number of Horikoshi’s signature character portraits, adding in a flavor of spring with motifs of flowers and greens. We truly hope you can enjoy it.